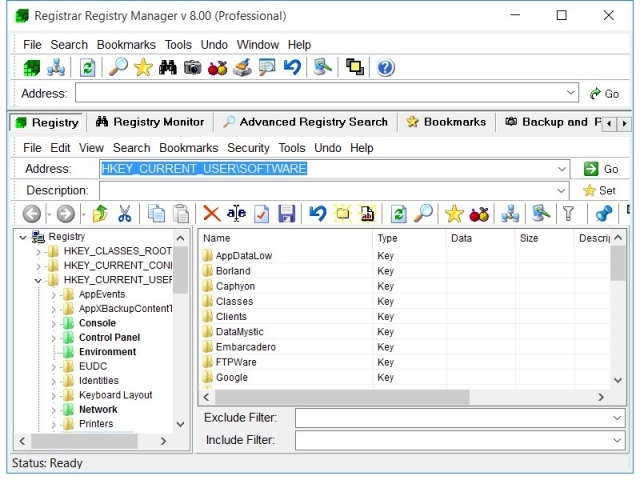 Registrar Registry Manager provides a common and user friendly interface which allows you to quickly find the keys and values you are looking for. The interface is similar to Windows Explorer. You can use the navigation buttons to browse through the registry. You can use drag & drop or the clipboard to copy and move registry keys. The address bar makes it easy to immediately access the registry key of your choice. The description bar will allow you to add notes to keys and values. Registrar offers blazing fast registry searches on both local and remote registries. Text, binary and regular expression searches are supported. Filters allow you to specify registry data size, value type and last write time ranges. From the view which reports matches you can easily rename, replace, delete or export found items. Registrar offers secure registry backup and restore, allowing you to recover from any registry disaster situation. Registry backups on disks can always be modified offline using the registry file editor. Bookmark often visited registry keys so they can be quickly accessed. 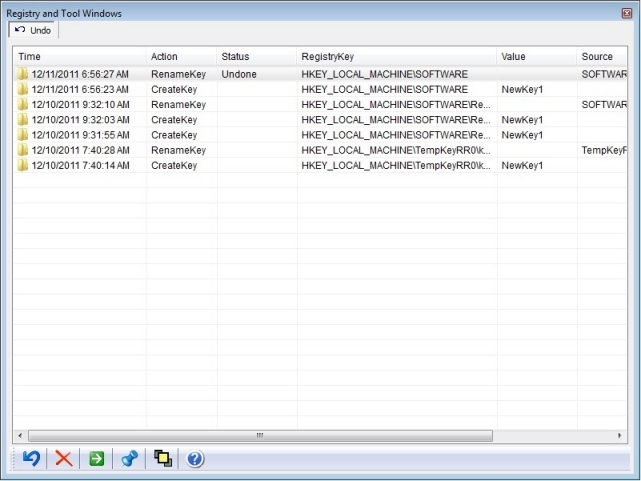 Registrar offers a registry bookmark editor with categories and optional key coloring. 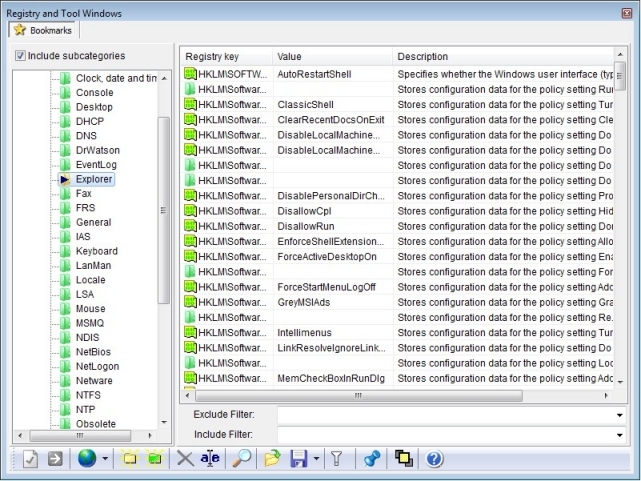 Open up as many remote registry windows as you need. Open registry files in separate editing windows and edit them as if it were your local registry. 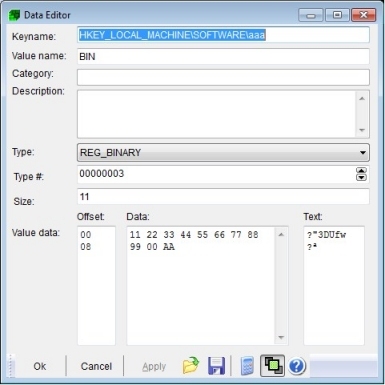 The registry file editor can be used to open registry files creating the backing of the registry of a system. If a system is unbootable due to errors in the registry, you can use the registry file editor to edit the offline registry hive files and repair the system. This feature has been a life saver in many situations. 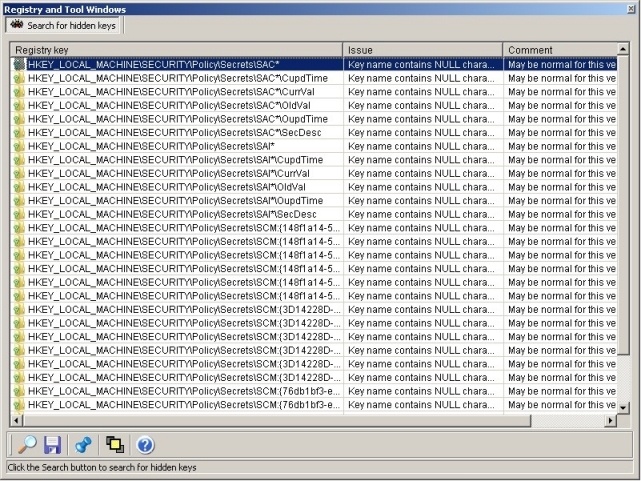 Monitor registry activity by the system and running applications. You can filter on activity and process name. 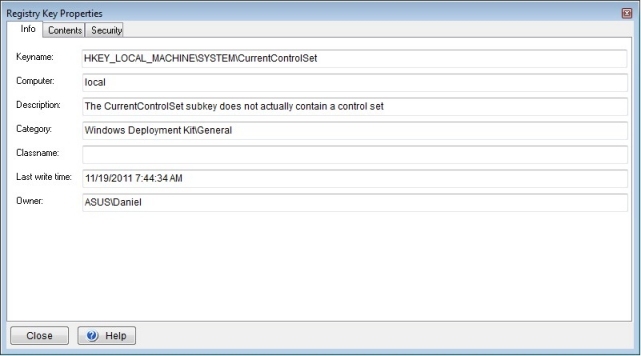 After stopping the monitor you can use non-destructive include and exclude filters to apply a search on logged items. 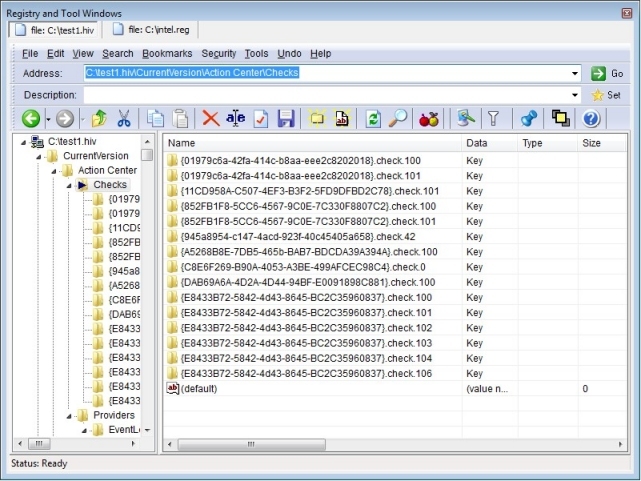 Get detailed information on registry keys including stats and security settings. 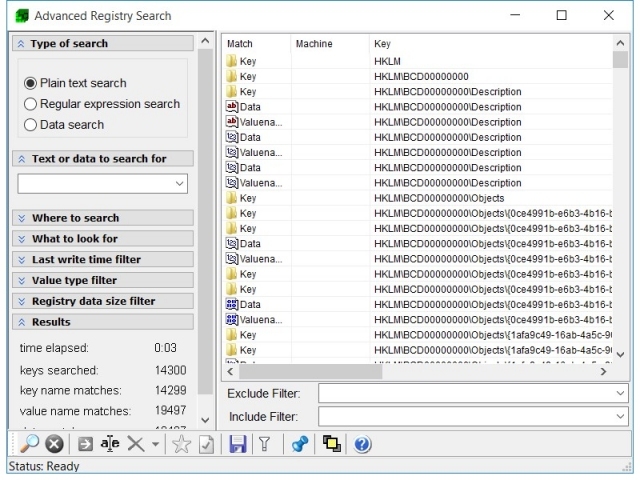 Registrar offers a registry data editor for every type of registry value. Registrar supports multi-levl undo. 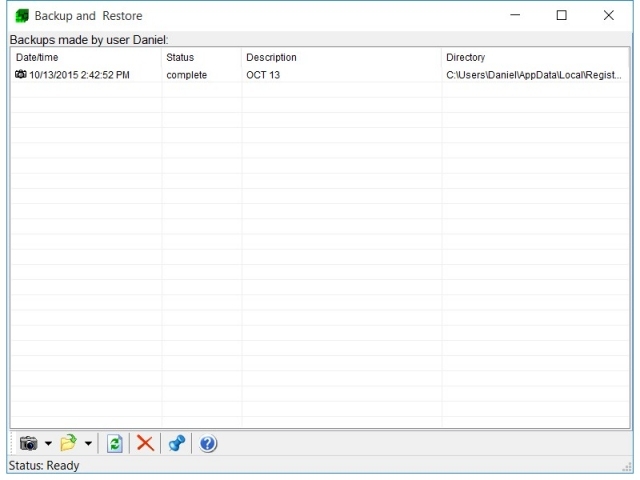 You can undo any changes made to the registry by using the undo feature. Simply press CTRL-Z tro undo the latest action or select any previous action from the list that Registrar maintains. Compare two registry keys with each other in detail. 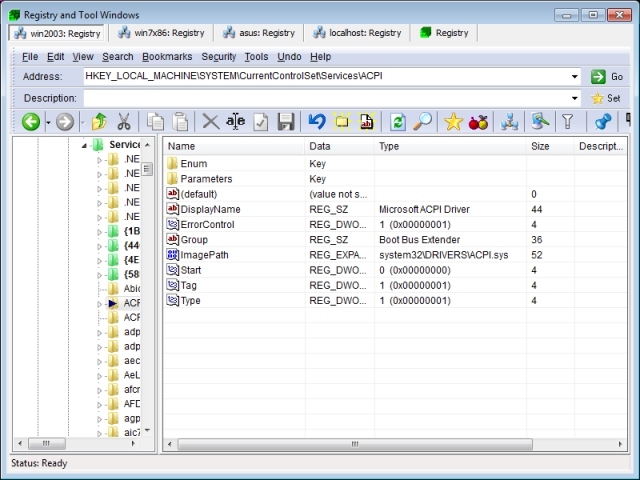 You can compare local registry, remote registries and registry files. Matching and missing items and differences in registry data will be reported in detail. Serach for references to files in your registry. The CLSID lookup utility allows you to find COM objects in your registry quickly and see what are their names, in-process servers and responsible companies and products. 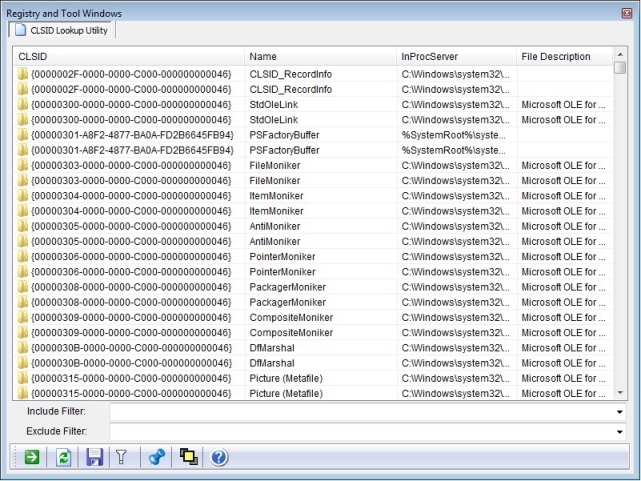 If you are browsing a registry key related to a CLSID, an automatic description will be generated. 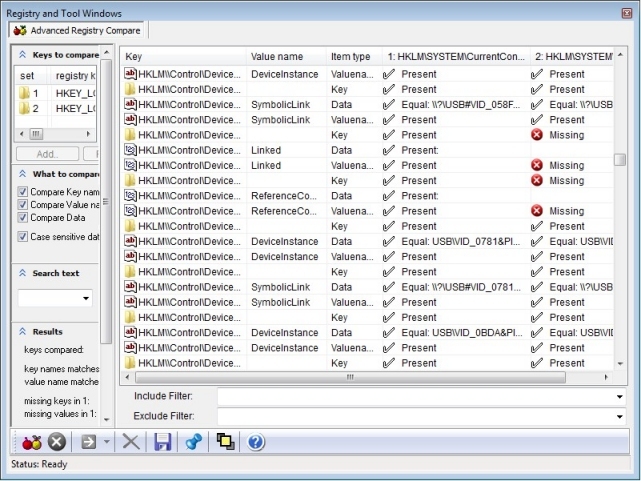 Search your registry for hidden keys that contain embedded NULL characters in their key or value name. Registrar offers a long list of options which allow you to fine tune the behavior of the software. The user interface can be tweaked and the software supports different layout schemes including a tabbed docking interface. Registrar comes with a separate, full-featured command line edition which allows you to schedule registry batch job on your network. The command line edition offers all the functionality of the GUI version. For a detailed overview of all features that Registrar supports, check out the feature comparison chart. Page generated on 4/19/2019 12:16:01 AM. Last updated on 11/26/2015 8:22:29 PM.